The Arizona Military Museum is housed in an adobe building, which served as a National Guard arsenal until World War II, when it was converted into a maintenance shop for German prisoners of war. Its military exhibits include a large weapons display and an Army Combat Helicopter (gunship) flown in Vietnam along with more than twenty-five displays of everything from uniforms to weapons to armored vehicles. The exhibits are arranged chronologically so the visitor can follow Arizona participation in the nation’s military history. The Spanish arrived in what is now Arizona during the 16th century. Conquistadors and Spanish Colonial Period 1528-1848: The Spanish conquistadors came to the New World in search of gold. This period covers the year 1739 with the discovery of the Arizonac mine, which gave Arizona its name, and extends to the arrival of American troops in Tucson in 1856. In 1821 when much of present-day Arizona was New Spain, Mexico secured independence from Spain. Mexican-American War 1846-1848: The war with Mexico was the first war driven by Manifest Destiny; the belief that it was America’s destiny to expand the country’s borders from the Atlantic seaboard to the Pacific Ocean. Mexico’s Revolution in 1821 had bankrupted the treasury, and so the United States acquired the land from the Gila River to its present boundary with Mexico under very favorable terms under the Gadsden Purchase. Now U.S. troops would protect the gold seekers on their way to California gold rush. Mormon Battalion: The Mormon Battalion, the only religiously based unit in United States military history, served during the Mexican-American War. The battalion was a volunteer unit of approximately five hundred Mormon men commanded by regular U.S. army officers. During its service, the battalion marched almost 2,000 miles from Council Bluffs, Iowa to San Diego, California. This remains as the longest single military march in U.S. history. 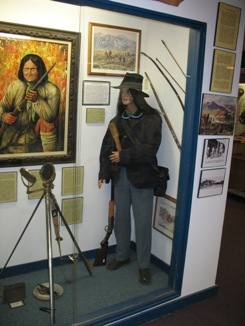 The Civil War in Arizona exhibit describes the three Civil War skirmishes fought on Arizona soil. Both the Union and the Confederacy wanted California because of its rich mineral resources; its vital access to the Pacific Ocean; and the conquest would help the Confederacy gain European recognition. Carleton’s California Volunteers established Camp Lowell in Tucson in 1862, Fort Bowie near Apache Pass and Fort Whipple near Prescott. Indian Wars in Arizona Territory: In 1864 the U.S. War Department authorized Governor John Noble Goodwin of Arizona to raise five companies of Arizona Volunteers. Many were Mexicans, Blacks, Tohono O’odham and Maricopas. Shortly after the Civil War on July 28th, 1866, Blacks were allowed to serve in the regular army. Six regiments, two of Cavalry and four of infantry were authorized. After the Civil War the military protected western settlements, explored the West and built roads. In the Rough Riders exhibit the visitor learns about the Spanish American War when the USS Maine was blown up in 1898. Arizona provided two troops, which became famous as the rough riders under Lieutenant Colonel Theodore Roosevelt. The Mexican Civil War is described in the On the Border exhibit. In 1916, during the Mexican Revolution, Pancho Villa’s men killed seventeen Americans in Columbus, New Mexico. President Wilson sent General John “Black Jack” Pershing into Mexico with an expeditionary force to kill or capture Villa. Both World War I and World War II saw great technological advances in military warfare. Men and women of color participated in World War II. Arizona’s 158th Infantry Regiment was sent overseas in 1918 where it served as honor guard and provided an honor band for President Woodrow Wilson during his residence in France. After the December 7, 1941 attack on Pearl Harbor, the 158th Infantry Regiment Division trained in jungle warfare in Panama. General Douglas MacArthur requested that the Bushmasters, who took their name from the deadly bushmaster snake, be sent to his command in the Southwest Pacific Theater. The Navajo code talkers and the Hopi tribe helped in the communications coding efforts during World War II. The Arizona National Guard retained the 158th Infantry until the unit converted into Military Police and Transportation Corps units on December 7, 1967. Numerous Arizona Army Air Corps training fields were scattered throughout Arizona. After the war Major General (Ret.) Barry M. Goldwater was instrumental in the creation of the Air National Guard. Arizonans have answered their nation’s call to arms during Korea, Viet Nam, Panama, Grenada, Desert Storm, Afghanistan, and Operation Iraqi Freedom wars. The Tet Offensive in 1968 describes one of the most controversial periods in U. S. military history. In the early morning hours of January 31, 1968, the first day of the Vietnamese New Year or Tet, Viet Cong and North Vietnamese Army troops and commandos attacked virtually every major town and city in South Vietnam hoping that large sections of the urban populace would rise up in revolt. These attacks were a military failure, but Walter Cronkite inaccurately suggested that America was defeated by the Tet Offensive. The Tet Offensive hoping to give a death-blow to the Saigon Government was a major military failure. Hanoi would conquer Saigon two years after U.S. combat troops left Viet Nam on April 30, 1975. Other exhibits include the Israeli–Palestinian conflict which is an ongoing dispute between the State of Israel and the Palestinians and is part of the wider Arab–Israeli conflict. Operation Enduring Freedom began in October, 2001 in response to the September 11, 2001 terrorist attacks on the United States. These are but a portion of the exhibits that tell about Arizona’s place in the national military. The Arizona Military Museum Library has a collection of books, periodicals, historical records, videos and written memorabilia, official military histories, specialized encyclopedias, copies of military orders and maps. All of the 1865-1866 muster roll records of the 1st Arizona Volunteer Infantry have been put on microfiche. They were volunteer Mexicans, Maricopa, and Pima Indians who were Arizona’s first defense force.